I've been meaning to read more YA sci-fi (no really, i made it a new year's resolution). To tell you the truth, it's an easy goal to meet because the 2013 YA sci-fi lineup looks amazing - from the gorgeous covers the story summaries. At the verrrrry end of 2013 we have one of my most anticipated books (sci-fi or not) of the year. It's an epic, with romance and mystery and two teens from different classes and a SPACECRASH. Oh, and did I mention that the lovely local author Meg Spooner is a co-author? Yes indeed. 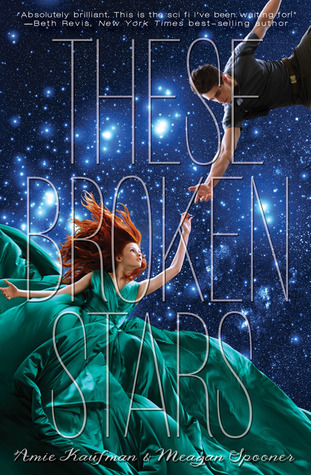 Amie Kaufman and Meagan Spooner’s These Broken Stars will be released on December 10, 2013 by Disney Hyperion. AND I CANNOT FLIPPING WAIT. One of the most gorgeous covers ever. Fine pick doll! This one has been on my list too. I love the cover and the story line! I can't wait until I can get my hands on it :) Great choice! Gorgeous cover, but I'm a bit wary of spaceship books since none have realliy impressed me since Snyder's Inside Out, may check some reviews out for this before I raed it! All the YA sci-fi, yes! This one is on my want list too. Yes please! I am dying to start reading this one - it sounds and looks amazing.